This chapter is divided into two parts. First, we will view the structure and dynamics of the Afro-Eurasian world-system in the centuries preceding the Age of Discovery. We will give particular attention to the issues of this world-system’s connectivity and prerequisites to its subsequent global expansion. Second, we will view the main directions of this world-system’s expansion during the Age of Discovery, which formed the basis of early modern globalization. 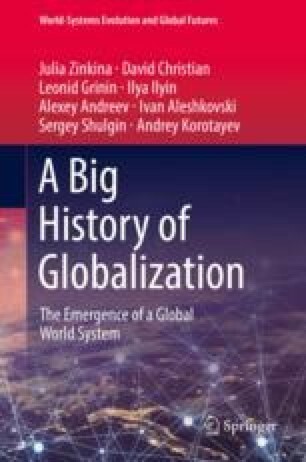 Then we will proceed to investigate some of the most prominent manifestations and consequences of early modern globalization, namely the intensification of existing transregional flows and interactions, as well as the emergence and sudden spread of new ones. For example, the “Columbian exchange” in flora and fauna led to a gradual globalization of the world’s staple foods, which changed the sociodemographic dynamics in most societies; globalization of pathogens led to severe cases of depopulation in some societies, dramatically changing the balance of power in the regions integrated into the now global World System; the structure of the world trade network transformed as new regions and their resources entered it; and the formation of a “global silver network” led to a sort of global “quantitative easing.” A truly global network space of flows and interactions emerged, which was to increase in density, variability, and importance in the subsequent centuries, prompting humanity to enter the era of modernity.